Yangon Kandawgyi Park is located on Kandawgyi Kanpat Natmauk and sugar. The Kandawgyi lake is quiet, reflective color sky. With golden spiers of Shwe Dagon pagoda on the top of the green forest along the river banks. The playground and picnic area is also a favorite place of you and your family. With a fairly extensive area, you can find many beautiful flowers, natural landscape of lakes and large cool shade makes you feel relaxed. Also, in the nature park also has an orchid garden, a children's area, mini zoo and the shops. Is not a natural lake Kandawgyi citation from Inya, a large pool of Yangon. But Kandawgyi favorable position than near the city, at the foot of low hills Singuttara where sacred Shwedagon Pagoda Burma's most famous located. In the middle of the lake there is another palace on barges Karaweil a mythical bird, it represents the architecture Myanmar. Also because it that increases the beauty of the garden. Free running on the blue lake, beyond the garden backdrop blue spring faintly glittering temples, there is a wooden road favorite photograph from the album take a selfie to the wedding ... of the young. 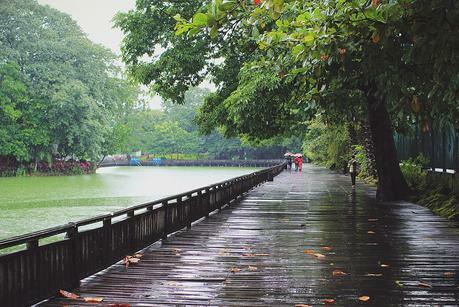 Visit Yangon Kandawgyi Park is one of the great things to do here. Because it is unfathomable transformation from the space of the city hectic move to the quiet. 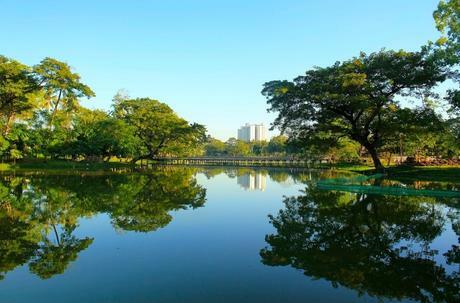 If you are a nature lover, and want to walk in a quiet and gentle, the Kandawgyi park is the most suitable place for you. Stroll in the park, you can not only admire the beautiful trees and flowers, but also see many rare animals. Besides, the park also has a large lake, where you can sit along the lakeshore boat and delight looked beautiful scenic surroundings.